Stick 'em up, said Pieter with the curt, hostile enthusiasm of a young boy. Stick 'em up, Mommy. I said stick 'em up. It was a filthy imperative in such a small, cherubic mouth. In THE CRACK Christopher Radmann returns to his native South Africa. This time to apartheid era, East Rand and the suburban, white-owned villas of Benoni. In the year of the Soweto uprising and the Sharpeville Massacre, Janet, an Anglo-South African housewife, is living with her husband and three children in the house where she grew up. Her cold, egotistical mother has succumbed to “Old-Timers Disease” and is in a care home. Her father has moved out of the family home in order to leave it to Janet and her family. The household runs smoothly thanks to Alice, the black maid, and the garden is maintained by Solomon the garden boy. The New Year heralds promise for them all. Janet is pregnant with their fourth child and Hektor-Jan, an Afrikaner raised on a remote smallholding with his tough brothers, guns and dogs, is starting a new job as an “interrogator” with the Benoni-Boksburg Riot Squad. A new year, a new start, a new life. 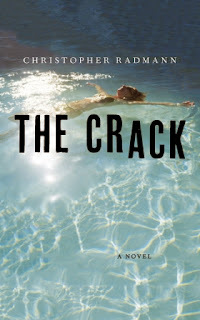 Until Janet finds the crack in the pool, a crack which mysteriously widens, filling her with dread. And Hektor-Jan's new job calls forth from him a dreadful skill whilst their manipulative neighbour begins to play Iago to his Othello. With his second novel Christopher Radmann continues to explore themes of damage, consequences and our own propensity for violence. I don't know if Radmann views himself as writing crime fiction, probably not, although his début novel (HELD UP) revolved around a car-jacking and its far-reaching repercussions. Yet within his work there are no detectives pursuing criminals, nor police procedures to be undergone. Nevertheless THE CRACK reads as a psychological thriller in which Radmann displays a singular talent for creating disquieting portraits of personal disintegration. Janet's punning thought connections, smeared metaphors and her growing obsession with the widening crack build a portrait of a fragile, anxious personality. But hers is not the only dissolution. Her husband finds a terrible gift within his new job and Radmann creates and plays superbly with dread as the story nears its horrific and bloody conclusion. My one quibble with Radmann's writing is with the dominance of a kind of “wrought” emotional symbolism which for me makes the final moments of THE CRACK ambiguous. But perhaps that is a question of preferences. The depiction of Janet's crumbling psyche is a feat of skilful empathic writing in this very dark book which offers no solutions but does give us the certainty that Radmann is capable of writing a truly psychological thriller. Karen - Looks like there are some fine reads here. Thanks, as always, for the round up.